Our New Year started with a bang - literally. Glenn was watching the Fiesta Bowl when - KABOOM! - the new stove exploded and he heard screaming. Marilyn and Isabel were preparing a cake to bake. Marilyn had turned the gas on but forgotten to push the button to ignite it. When she realized her error after about 5 minutes, she tried to explain it to Isabel, but Isabel didn’t really understand what Marilyn was telling her and told Marilyn to go ahead and light it. Marilyn didn’t say, “No,” figuring Isabel had more experience with gas stoves. When the oven was lit with the push-button electronic starter, the gas exploded. Glenn felt it at the other end of the house. The stove moved away from the wall about three feet, though that was partly because it was on wheels. There was a pot of boiling water on top of the stove, and that was flung onto Isabel. Marilyn and Isabel were in front of the stove at the time, but the pot happened to be directly in front of Isabel. The boiling water was flung onto Isabel’s middle section, dripping down one leg and onto a foot. The screaming was Isabel experiencing the pain of that water. Isabel got into the shower immediately, but still ended up with first- and second-degree burns. Marilyn took her to the hospital, along with Yolanda and Elvis (Isabel’s oldest son), who had happened to come home from work in Quito that afternoon. A hospital doctor peeled off the skin that had blistered and gave her some pain medication (in that order) while Marilyn held her hand to help her relax. For Isabel, it was a very painful procedure. Needless to say, she didn't sleep much during the night. Fortunately, Yolanda and Carrollito were visiting at the time and were able to help a great deal. Carrollito cleaned up while the others were at the hospital and made certain everything was still connected properly. Marilyn told Glenn later that she had thought about opening the oven door to let the gas escape, but hadn’t thought about turning the burner off first. If she had done that, there could have been a flash fire, resulting in much more serious injury and damage. Glenn only realized this after he had time to think. If he had been in the kitchen and understood what was happening, he’s not sure that he would have thought fast enough to help. Isabel was able to eat breakfast with us in the morning, though she was in a lot of pain. Yolanda (a sister) and Lorena (a niece) came over while we were eating and had breakfast with us. Marilyn went to teach her classes, and Yolanda, Lorena, and Elvis took Isabel back to the hospital to have some more skin peeled off. The hospital personnel told Isabel that she'd have to do that each day for 10 days. We were pretty glum around the house that day. Neither Marilyn nor Glenn were impressed with the (lack of) pain management at the hospital. When Yolanda came over that morning, she had a baby bird in her hand that she had found. She left it on the kitchen table when she went to the hospital with Isabel. Later, Victoria was sitting at the table and saw it. Having poor eyesight, she thought it was a piece of dirt and reached to pick it up. It squirted out of her hand and fell on the floor. Glenn later had to back away from his desk in the office for some reason and saw Canela, our dog, chewing on something. It was the baby bird! He shouted at Canela and called Marilyn, but it was too late. At lunch, someone asked about the bird. Glenn had to tell everyone that Canela had eaten it. That elicited a group groan. Cesar y Luz (a brother and his wife) came to visit Isabel about 5:00 p.m. In fact, throughout the ordeal, there was a ton of family support. Oliva came over in the morning. She didn’t know about Isabel’s burns. Patricia and Yolanda came over a little later. Yolanda came to cook and generally provide support for Isabel. (Brayan was not fond of Marilyn’s norte americano cooking unless she was making pancakes, coffee cake, or a desert.) Patricia came to provide support and help take Isabel to the hospital. Yolanda, Oliva, and Patricia are all sisters of Isabel. Marilyn and Patricia took Isabel to the hospital at about 1:00 p.m. for her treatment. The hospital doctors suggested Isabel see a burn specialist in Ibarra, primarily to make sure she was receiving the proper treatment. They also said she may need plastic surgery. Since none of the burns were visible with clothes on, Isabel said she probably wouldn’t bother with that. The hospital told her to come back later for a prescription to see the specialist in Ibarra the next day. We ate lunch after that. Then, they all took Victoria to get an X-ray of the arm she broke about a month ago, and to see the doctor after the X-ray. He told her that the cast would come off in three weeks. Victoria was disappointed because she was expecting to get the cast off that day. They went to the hospital to get the prescription for the specialist after taking Victoria to her doctor’s appointment. They were told to get into line, but the window closed for the day before they made their way to the head of the line. They would have to go back early the next morning. Thursday was a good example of how public healthcare works in Ecuador. At 6:00 a.m., Yolanda got to the hospital to wait in line to get an appointment to see a doctor so Isabel could get the papers she needed to transfer to the doctor in Ibarra. Marilyn and Isabel arrived at 8:00 a.m. to find out that Yolanda needed a copy of our light bill that showed we were current on our payments. (Why the electricity bill? 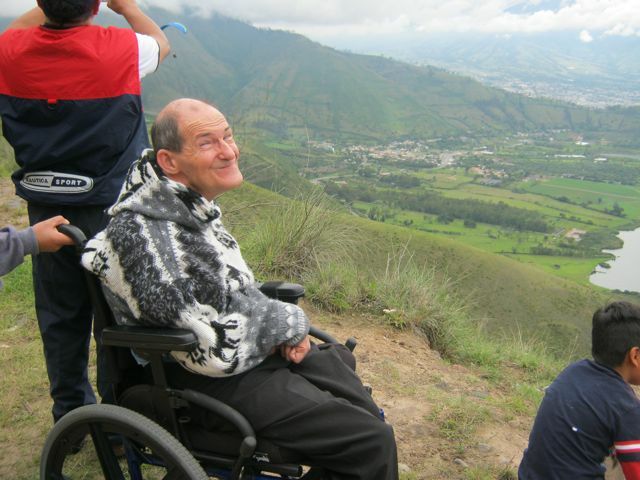 We guess to prove that we lived in Otavalo so Isabel could get services at the hospital.) Marilyn drove home to get that, while Yolanda went back to the end of the line. About an hour later, she was first in line again, only to find out that she was in the wrong line. (It wasn’t as it they had signs saying which line was for what. In fact, it was the same line they had been told to get into the day before.) Yolanda moved to the correct line and waited another 45 minutes. By this time, it was about 11:00 a.m.
Yolanda got the papers she needed for Isabel to see an internist and they all moved to another part of the hospital to wait some more in order to get Isabel's blood pressure, temperature, and weight taken. That didn't take too long. Then they waited some more to see the doctor. After about 10 minutes, it was Isabel’s turn to go in to talk to him about being served at the special burn unit in Ibarra. Before he had the paperwork filled out to change hospitals, he was called into surgery to treat a child. He told them to wait and that he'd be back in an hour. They decided to drive home to wait (it was only about 5 minutes away). Marilyn started working on lunch so it wouldn't take too long when Brayan returned from school about 1:45 p.m. They returned to the hospital and finally got the papers to make the transfer. The doctor suggested they arrive very early on Friday morning at the hospital in Ibarra. They then moved down the hall for Isabel’s curación, a process in which a nurse removed dead skin from Isabel and re-bandaged her wounds. After around 10 minutes or so, the nurse appeared and they found out that Marilyn needed to walk over to the pharmacy to get some more antibiotic cream and antibiotic gauze. The treatments may have been free, but Isabel had the responsibility of purchasing her own medications and supplies. Marilyn walked a half block to the closest pharmacy. They had the cream, but not the gauze. Marilyn walked another block to the next closest pharmacy. They didn't have the gauze either. Marilyn walked 3 more blocks to the next closest pharmacy. No gauze. But the astute pharmacist looked up the name of the medicine that Isabel had written for Marilyn (because Isabel knew Marilyn’s memory of the strange word might not last until Marilyn got the item), only to find out that it didn't exist. She asked Marilyn what it was for and Marilyn told her quemada (burns). She thought a few seconds and went and got the gauze from the back. Isabel had written down the wrong name. The patient in front of Isabel was also waiting for his friend to return with the same gauze. So they gave the nurse some of what Marilyn had just bought to help speed things along. The man was treated and Isabel began her treatment around 12:30 p.m. It took an hour and a half to change out her bandages, clean her wounds, apply antibiotic cream, cover the wounds with antibiotic gauze, and then tape down another type of gauze. They got home around 2:10 p.m. Marilyn quickly finished making lunch. While we were eating, Marilyn asked Isabel what time she wanted to get to Ibarra the next day. Isabel immediately called a relative who worked in the hospital at Ibarra to ask what time he thought she should get there. He said there were no open appointments, but he'd call back in 10 minutes. He called back and told her she had an appointment for Saturday at 8:00 a.m. The bandage changing was to prevent infection, which burn patients are at risk for. It was pretty painful. In the evening, Marilyn looked up some information about burns. She found that there was a Rule of Nines that was used to estimate the percent of the body that got burned. The chest accounted for 18%. Isabel was only burned on one side and it wasn't the whole chest, just spots (although a couple were pretty big). Marilyn estimated that she probably was burned on 4-5% of her body. That was the second-degree burns. She also had some first-degree burns, which were healing up nicely and not bothering her at all (or causing any pain). When she got home, Isabel was in a lot of pain, more so, it seemed, than the day before. Isabel was feeling much better in the morning. We were glad to see that after yesterday afternoon, when she hurt so badly. When she came back from her treatment at the hospital she felt much better than she had the day before. On Thursday she had had a different nurse than the one who had helped her on Wednesday. Therefore, Marilyn and Isabel had made sure to get to the hospital before the nurse Isabel had had on Wednesday went off duty. We received two emails from different staff at Global Ministries. They were very supportive, offering to pay any medical expenses. Thus far, because of the free hospital care and the relatively low cost of medicines and medical supplies, we hadn’t had any problem covering the costs, and didn’t expect any problems. Galo, Isabel’s half-brother and the person whom Elvis works for, came from Quito to visit Isabel this afternoon. Galo had never been to visit Isabel before. We were impressed with the way the entire family supported her. We were up early so Marilyn could get Isabel to her doctor’s appointment at the hospital in Ibarra by 8:00 a.m. The specialist told Isabel that she only had to have her curación twice a week instead of each day. She liked that, because it really hurt when they peeled that skin off. We thought it may hurt more after three or four days, when the skin might adhere more to the bandages. We also worried about infection if she had it cleaned that seldom, since she couldn’t clean underneath the bandages herself. There was no need to worry about Isabel hurting more or maybe getting an infection. Those things didn’t happen. After about two weeks, she was pretty much back to normal. We made her rest as much as we could, but she wanted to get back to work as soon as possible. We all learned some valuable lessons. One was to respect household appliances more. Another was to make certain we understood each other before proceeding – with anything. After breakfast, we headed for Volcán Cayambe. We had never explored this particular area much. Running a little late, by the time we got to Luz and Cesar’s restaurant to pick up Maria Augusta, she was crying. She thought we had forgotten her. When she got into Molly we assured her that we could never forget her. She’s just too sweet (though we didn’t tell her that part). We didn’t go the way to Volcán Cayambe that Marilyn and I had expected to go, which is marked by a large sign on the Pan American highway that says “Reserva Ecológica Cayambe-Coca”. 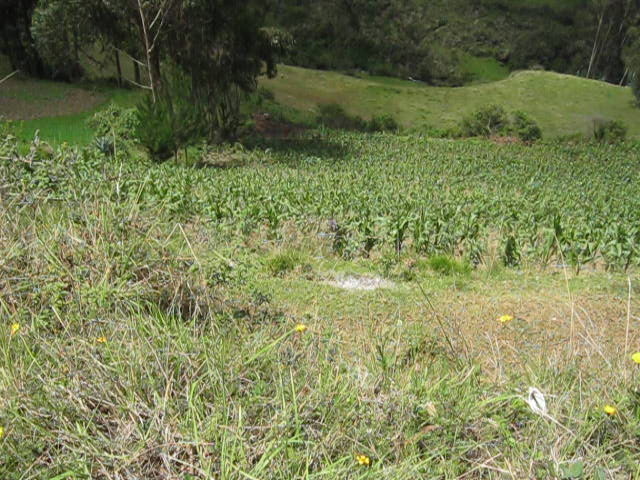 Instead, Isabel led us through the town of Cayambe to a road leading up the mountain that was none-too-well marked. It led to what was called Nevado Cayambe. At the end of the road, inside the National Park, was something called Refugio, a stone building at or near the snow line. That was our destination. A feel for the road. Waving grain. A field of maiz. The road was mostly cobblestone, but had all kinds of potholes, so we bounced a lot. I began to wonder if my neck could take it. Isabel, Brayan, and Maria Augusta hit the ceiling at least a couple of times each. The dirt stretches of the road weren’t much better. They often had huge ruts. But the scenery was beautiful, especially on what turned out to be a beautiful day. We went up and up on Volcán Cayambe, the third tallest volcano in Ecuador, until the road became impossible for our car Molly. We parked the car at about 13,000 ft. (estimate). 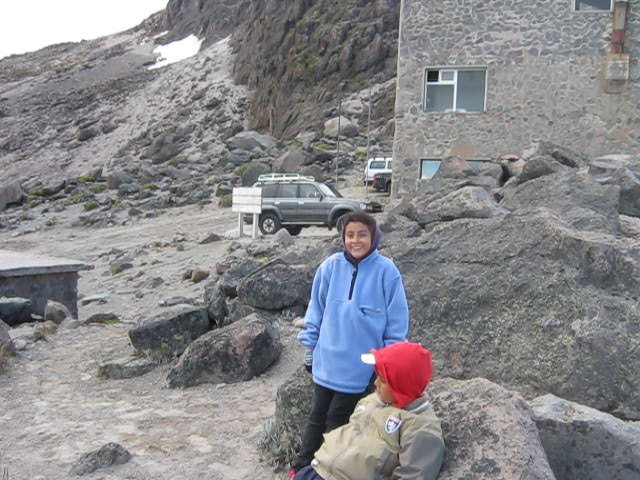 Then those who could do so hiked up to about 14,500 ft. to see the Refugio, the end of the road. Victoria and I stayed in the car and looked at the birds and magnificent vistas. Actually, Victoria started hiking with the rest, but soon had to give it up and come sit with me because of the distance and altitude. While waiting, I saw several people walk or ride back down the road in heavy-duty 4x4s. Many looked like they were dressed for hiking in the snow and were with guides. I’m sure they had hiked to the top of the mountain. After the cars that were parked near us had left, I saw a dog coming down the mountain road. Dogs are everywhere in Ecuador. As it got closer, I notice that it had a really bushy tail and a wolf-like head. It was smaller than what I would expect of a wolf, however, so I figured it must be a dog or coyote. It went around the back of our car, out of my sight. Believe me, I kept a sharp lookout after that because my window was down. I finally saw it go back up the road and noticed that it was careful to stay to the side, as if ready to head for cover at the first sign of moving humans. Meanwhile, the hikers were having a great time. 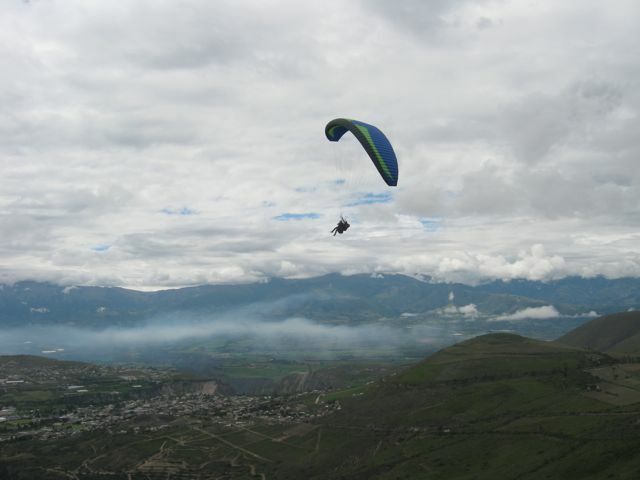 Only Isabel had been on Cayambe before, and that was so long ago that she didn’t remember much. They found a patch of snow not too far from the Refugio. Neither Brayan nor Maria Augusta had ever been in snow. Of course, they had a snowball fight. Heading down the mountain, we stopped at a nice looking flat to eat our picnic lunch. The flat was not only attractive to us. Some horses were grazing there, too. That was fine with us. Share and share alike, right? Pretty soon some cows came into view. As they moved closer, we discerned that one was a bull. They came closer. Isabel and the children started to get nervous. The bull was not thinking of giving the car a wide berth, as the horses had done. He kept walking directly towards us. He won that game of chicken. When he stopped thirty or forty feet away and stared at us intently, Marilyn put Molly into gear and we sidled on down the road a bit until we felt comfortable enough to finish eating. 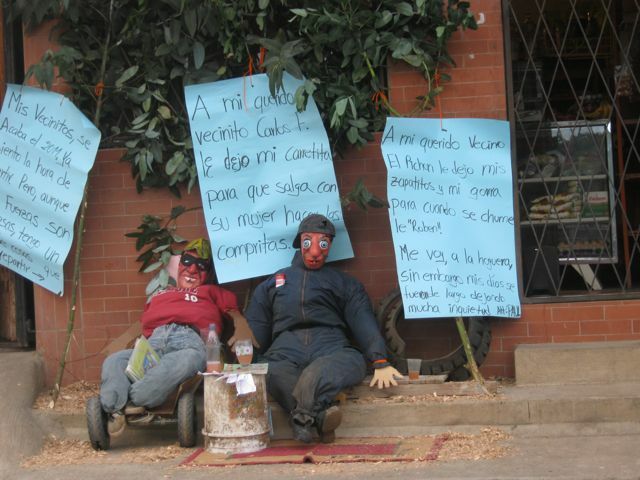 We saw a lot of effigies on the way back. People construct them so they can burn them at midnight on New Year's Eve. They represent the bad things that have happened to people throughout the year. They also represent the energy associated with those events. By burning the effigies, the air is cleared for the New Year (unless you're standing too close to the smoke). 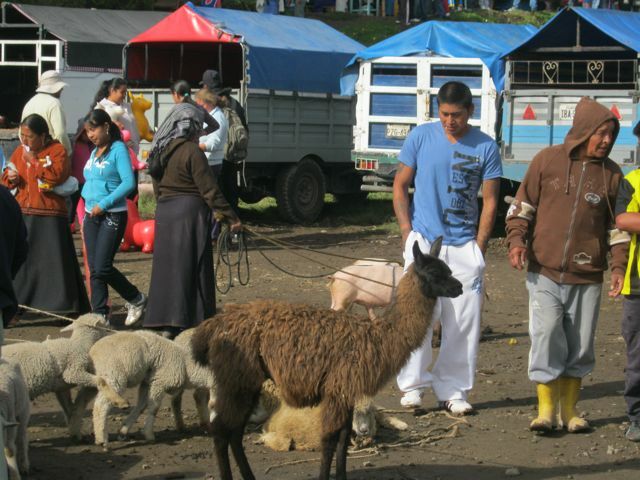 The road was blocked at Juan Montalvo (a suburb of the town of Cayambe) so people could play volleyball. (This was New Year’s Eve, after all.) So we turned around and picked a cross street. 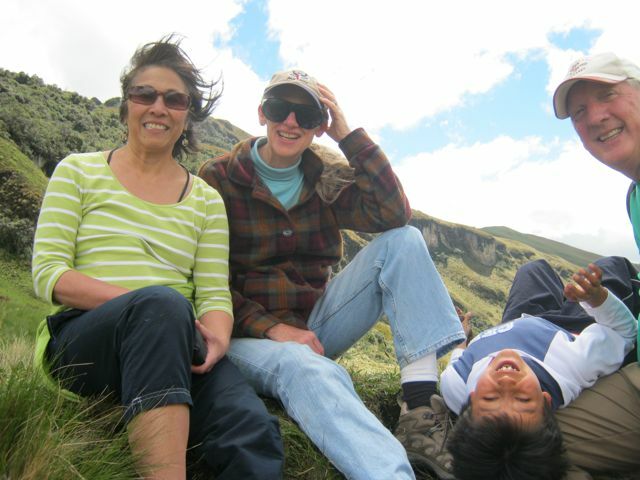 Isabel used to live in Cayambe, so we were pretty sure we’d find our way with no problem. We were stopped before we had gotten very far. Some boys held a rope across the street to block our passage while a young man in a woman’s dress and a mask did a little dance, then asked for some money before we passed on. Marilyn gave him 50 cents and we were on our way. We had seen this custom last year when we were walking around Otavalo on New Year’s Eve. So, we’ve added another excursion to our repertoire for when people come to visit. Too bad we didn’t find it until after Roberta and Tom left because the whole trip was truly gorgeous and fun. I met Roberta long, long ago, in a galaxy far, far away. Well, sometimes it feels that way to me. Actually, I met her when I received an award and spoke a few words at a convention in San Francisco. She introduced herself to my mother and myself after my little speech. We exchanged contact information. The next year I went to visit Tom and Roberta in Tacoma for a few days on my vacation. When they took me up on Mt. Rainier our friendship was sealed. I’m a sucker for mountains. Marilyn and I have visited them once – maybe twice – I can’t remember. Now they were coming to Ecuador for a vacation and spending several days with us. We were excited. I went with Marilyn to her Professores y Parientes (Teachers and Parents) class at 3:00 p.m. and waited in the car. I watched dogs scrounging for food and a few people walking around. Gonzales Suarez is not nearly as bustling or prosperous as Otavalo. At first, Marilyn gave up at 3:05 p.m. because no students had shown. Before I could suggest she wait another 10 minutes, one of her students came, so she taught the class. Nine more showed up in short order. 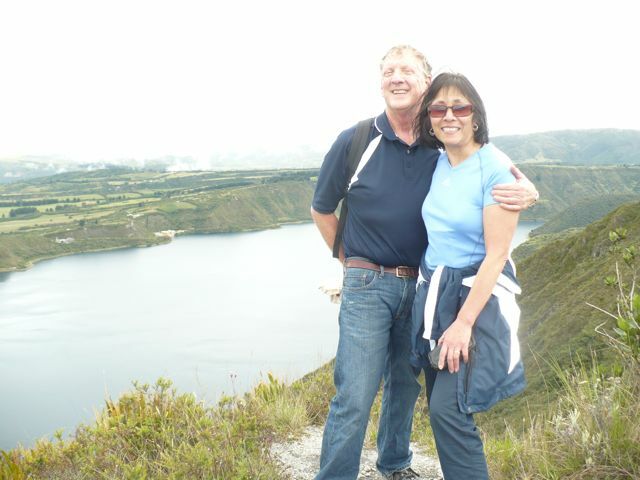 At 4:00 p.m., we headed for Quito to pick up Tom and Roberta. Their plane was not scheduled to arrive until 11:09 p.m., so we hung out with our friends Blanca and Luis. That’s always fun because they are both so positive. They fixed a nice dinner for us, and we all took naps before Marilyn and I had to leave for the airport. We had no problem getting to the airport and parking. It was timed to coincide with their plane landing, so we only waited about 50 minutes for them to clear customs. It’s kind of fun waiting for people at the Quito airport because it reminds us of when people used to wait for loved ones with excitement and anticipation at the gates of US airports. This waiting was in the main lobby, but it had the same feeling. People had flowers, balloons, signs - you name it. There was no trouble spotting them because I had asked them to send a picture beforehand. Even though we had known them for a long time (over 30 years for me), we hadn’t seen each other in quite a few years. Tom and Roberta had huge smiles. It was obvious that they were excited to be on vacation in Ecuador. We got to the Ambassador Hotel a little after 12:30 a.m., talking excitedly in the car, and went straight to bed. The Ambassador Hotel’s dining room was closed, so we ate breakfast next door. Next, we went looking for the offices of Siona Lodge, which was the place where Tom and Roberta wanted to have their jungle adventure. Roberta and Tom didn’t feel comfortable wiring the money, so decided to use a credit card when they got here, even though it meant running the risk of there being no vacancy when they wanted to go. They didn’t bring the address, so we used the address I had gotten from the Internet. There was a different lodge (their second choice) at the address I had. After looking around and not finding their first choice, they decided to talk to their second choice. Roberta did all of the negotiating and Tom hung around with me outside. Just when it seemed they were about to close the deal, they found the dates they needed were not available. Back to square one, almost. I had my computer and Internet modem with me, so Roberta and Marilyn got on the Web and found another address a couple of blocks away. On our way over there, we ran into Bill Grochowski, who owns Confederate Books, a bookstore that sells used books in English in Quito. That was a pleasant surprise. Marilyn and I had met him while he and his family were vacationing at the Hacienda Ally Micuy (where we lived for eleven months) in Otavalo. Maybe Quito’s not so big after all. We didn’t find the Siona Lodge offices, but we found a tour operator for Siona Lodge. It wasn’t available (the chance they had taken), so Roberta set about negotiating another lodge. It took quite a bit of time to find a suitable alternative, and the prices were higher than those Roberta had seen on the Internet, but the deed was eventually done. They decided that they were on vacation and could afford to spend the extra money. We then went to the Panecillo. I got us lost on the way by trying not to go way out to the route that we know. In some ways, it was a nice detour. (Naturally, I would say that, since I’m the one who got us lost!) We got down to a river at one point and the houses were interesting. Eventually, we found our way to the Panecillo. 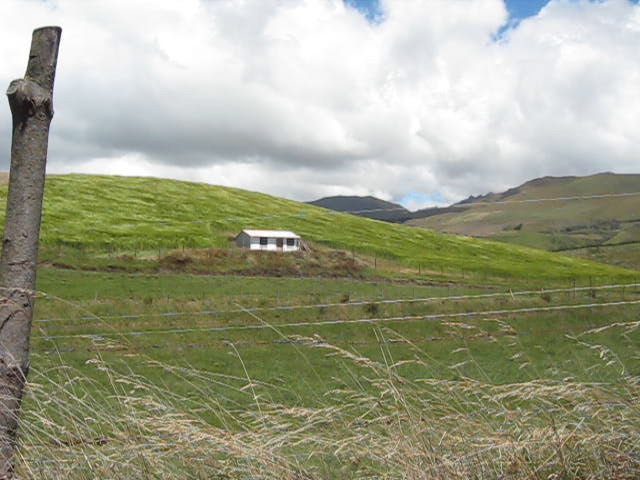 After all, the hill on which it stands was visible during most of our drive. It's just that Quito often has no direct routes from point A to point B, and many streets that turn out to be one way, the wrong way. 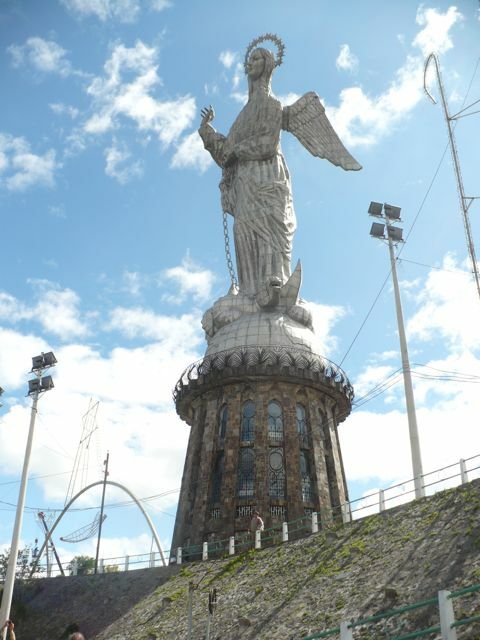 Tom read that the Panecillo was erected in 1976, which surprised all of us. We thought it was much older. 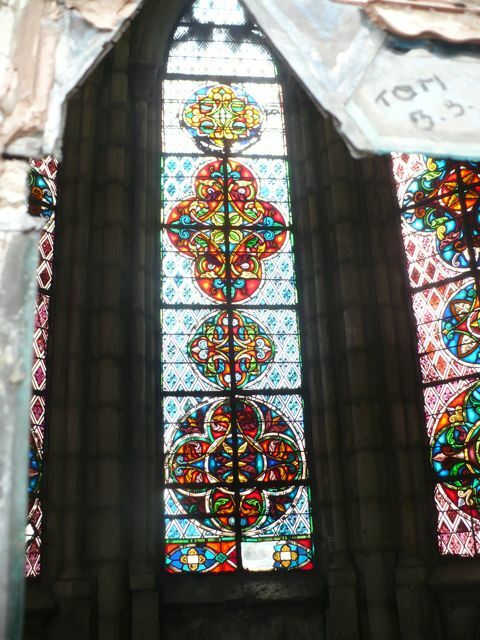 After that, we went to the National Cathedral. We had tried to go to Iglesia Jesús de Compania, but couldn’t find any parking nearby. (This time I didn’t get us lost.) Marilyn knew of an accessible entrance on the south side that I hadn’t known about. Though we had to go up a really steep hill to get there, we were all glad that Marilyn had known about it. However, it only led to the tower climb, so I still haven’t gotten to see the inside of the National Cathedral in person. While Marilyn, Roberta, and Tom did the climb, I waited outside on a beautiful, partly cloudy day and drank a cup of expensive (for here) hot chocolate. But it was good, being laced with cinnamon. Unfortunately, as sometimes happens, I couldn’t stop sucking through my straw fast enough one time and burned the roof of my mouth. It hurt for five days. Still, it wasn’t as bad as it would have been if it had been my tongue. 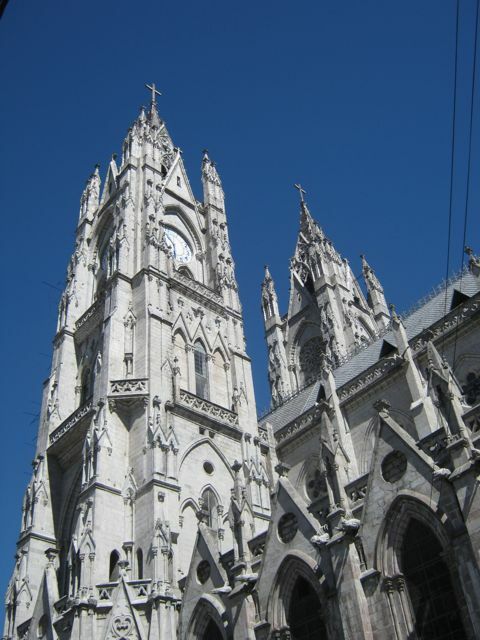 We were going to go around to the other end of the Cathedral to go inside but ran out of time because I was anxious for Tom and Roberta to experience the drive to Otavalo in the daylight. The weather cooperated on our drive and we saw some great mountain scenery. We didn’t go to the family novena after we got home because we were all bushed. However, Marilyn did take Victoria, Isabel, and Brayan over before we ate. Roberta went with her and met some of the extended family. We went to an ATM after breakfast, before doing anything else. 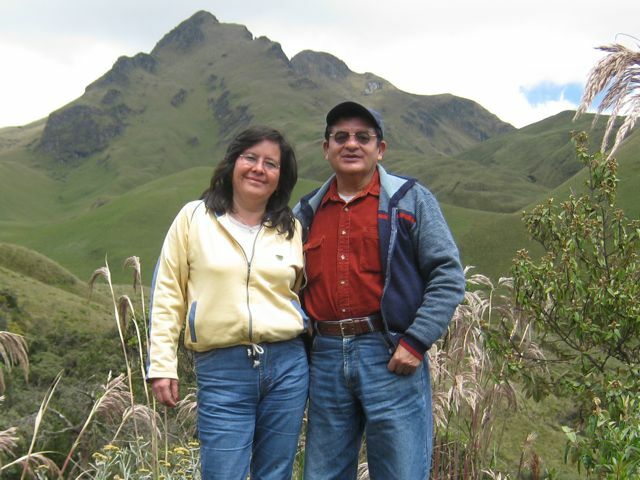 Tom and Roberta had expected to use a credit card for their jungle excursion, and that turned out to not be possible because cash is king in Ecuador, even at most stores in the big cities. Thus, they used almost all of the cash they had brought with them on making those arrangements. I insisted on going this morning because, with the holidays, there was no telling when (or how long) the banks would be closed, or when the ATMs might run out of money. After the ATM stop, we took them to see San Miguel Arcangel, one of our favorite overlooks of Ibarra. Originally, the plan had been to take them up to Laguna Mojanda on Fuya Fuya. However, we could all see how socked in with clouds and fog it was up there, and I came up with alternate plans, convincing Marilyn to save Fuya Fuya for a better day and not try to force things. Roberta and Tom had read about the wood carving at San Antonio de Ibarra, so we stopped there for a few minutes on the way to Ibarra. Victoria and I stayed in the car. Tom didn’t have much interest in shopping, so he walked around the square. But Roberta, Marilyn, Isabel, and Brayan went into a few of the shops. 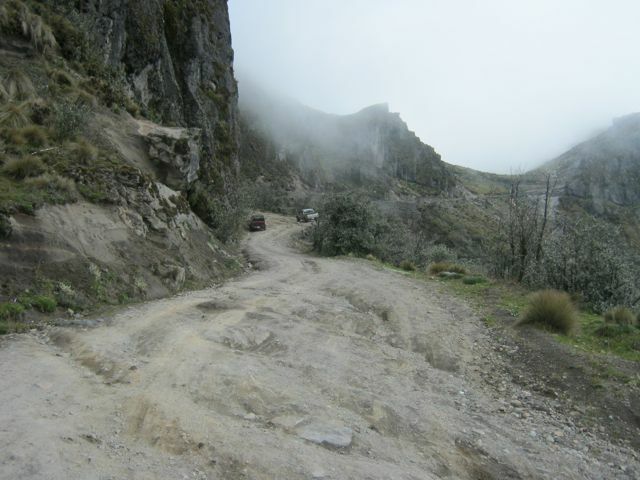 Normally, after messing around San Miguel Arcangel for a bit, we take the back road down to Lago Yahuarcocha. But I had always wondered about La Estelita, a restaurant literally up the road which advertised the best view of Ibarra. Tom and Roberta wondered about it, too, and suggested we check it out. When Marilyn told me what we were doing (because I had been in the car when the decision was made), my first reaction was to skip it today because it was getting close to lunchtime and we needed to get down to Lago Yauharcocha if we were going to eat tilapia. But, happily, I was overruled and we ended up finding a jewel. La Estelita A view from La Estelita. As we left San Miguel Arcangel, a sign said that La Estelita was three more kilometers. It seemed much more than that, as we slowly wound our way up the mountain on a cobblestone, sometimes dirt, road. We found La Estelita and decided to eat there. 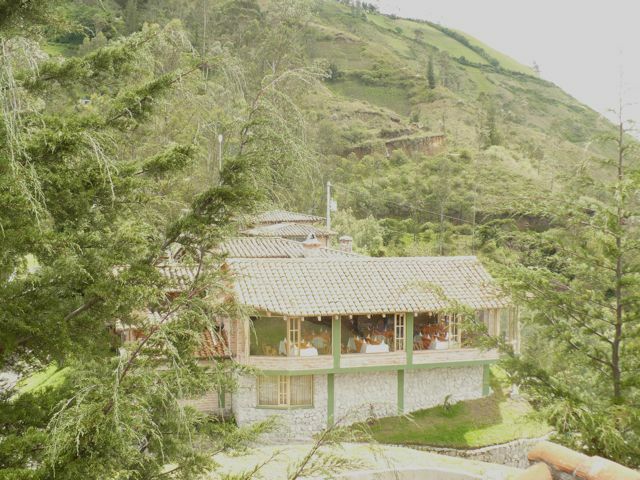 It’s actually a very nice hosteria (hotel in the country, according to Isabel) with a restaurant. Tom didn’t want to eat there because the prices were pretty high, and he didn’t want us to pay for it, but I convinced him to split it. There were no other customers there when we arrived, but a chef in white got busy as soon as we decided to eat. The view from where we were seated was spectacular. 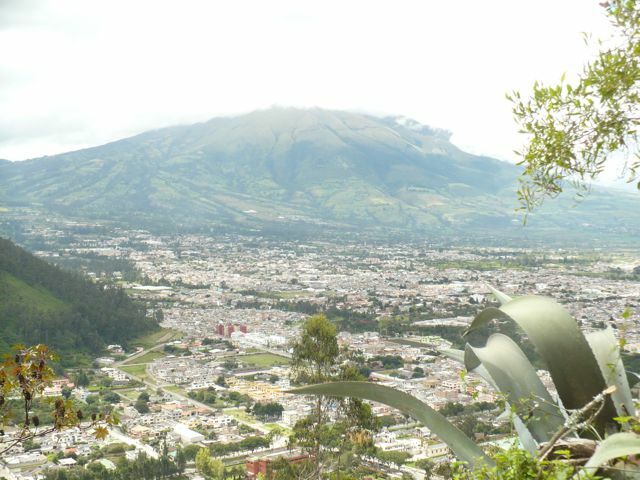 From high on the mountain we overlooked the town of Ibarra, as well as the western and northern flanks of Volcán Imbabura. (Clouds obscured the top of the mountain.) While waiting for the food, everyone (except Victoria and myself) explored the well-groomed grounds. 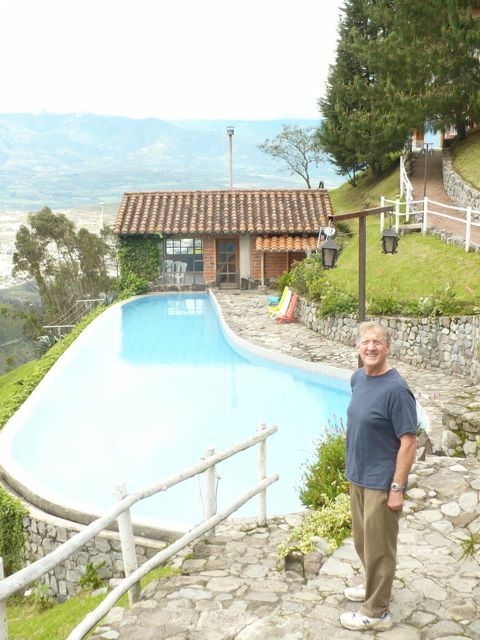 They found a heated swimming pool and rooms with views just as gorgeous as the view from the restaurant. When we did eat, the food was very good. So, we have now found another attraction to which to take our guests. After lunch, we drove back down to San Miguel Arcangel and this time we did take the back road down to Lago Yauharcocha. We parked and walked around part of the lake, stopping to watch someone practicing moto-cross on the dirt track. We gave him a few cheers, but we doubted that he heard us. Next, we had helados at Rosalie Suarez, a traditional stop for our guests. They are more of a sorbet than ice cream, and the fresh fruit makes them really good. 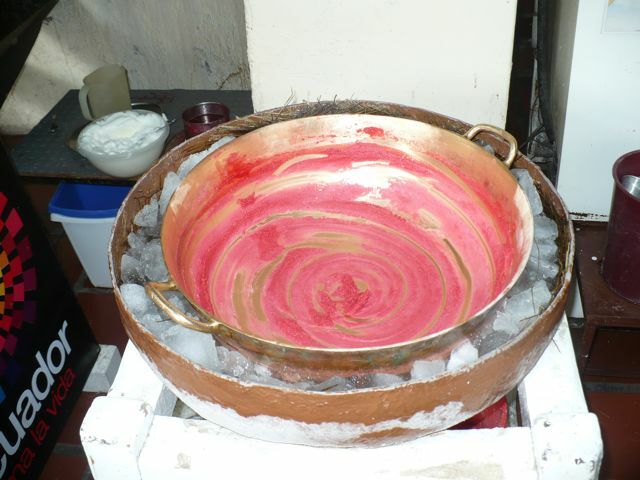 (Another visitor we had last year has told us that the helado she had in Mexico this year was not nearly as good.) Roberta and Tom also got to see how it was made. The water was not working when we returned home, but came back on within an hour and a half. Just before we got to the house, I noticed that the fire hydrant around the corner was opened fully and I wondered about vandalism. There were three teens nearby and no firemen. Tonight’s novena was at our house. 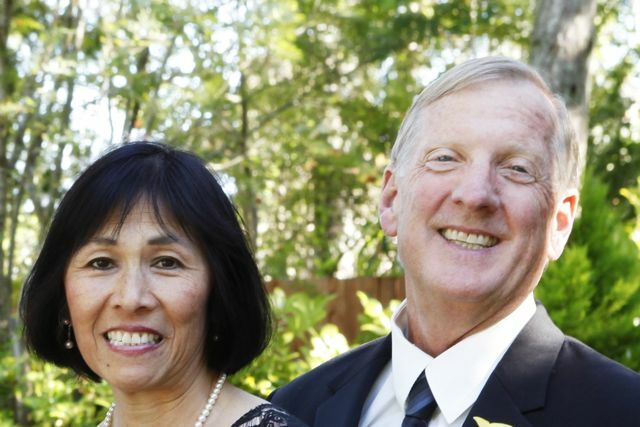 Roberta and Tom enjoyed meeting all of the extended family, and they began remembering names and family connections much faster than we had when we first met the extended family. Roberta and Tom are also Catholic, so they felt comfortable at the novena. The Caluquí pre-school changed Marilyn’s English class to 7:30 a.m. today because of a field trip to a bank (or, that’s what we understood). Despite the early hour, Tom and Roberta went with Marilyn. Roberta teaches a pre-school in Tacoma for children with disabilities, so she was interested to see what Marilyn’s classes were like. We had breakfast after they came back. Then they went to Marilyn’s other two pre-schools. After lunch, we walked to the Mercado with Roberta, Tom, and Brayan. As we started out, I noticed that it was clear on Fuya Fuya and suggested we take the opportunity to go up there now because there might not be too many chances to go while it was clear. But no one really wanted to change plans. At Plaza de Ponchos, 9-year-old Brayan kept dropping subtle and not-so-subtle hints that he would like one of us to buy this or that for him. Nobody bit, however. Pobre Brayan. When we got home, all of them, plus Isabel, hiked to Cascada de Peguche. The novena was held at Pilar and Galo’s tonight. Jorgé Luis had a new iPad that he wowed his cousins with. I drank some liquer and people like Tocayo and Carollito laughed and winked at me. I think they expected me to get drunk or something. Sorry, guys, but those days are long gone. 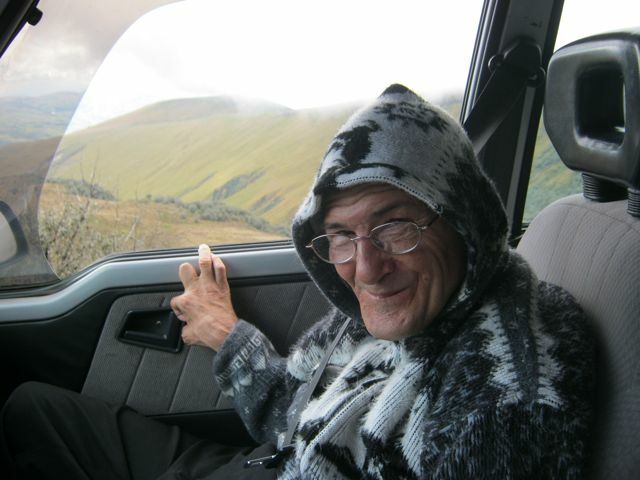 It was a beautiful morning so, after breakfast, we drove to Laguna Mojanda high on the slopes of Fuya Fuya. We even saw snow-covered Cayambe along the way. Victoria and I stayed in the car, but the rest went hiking for about an hour and a half, maybe two hours. 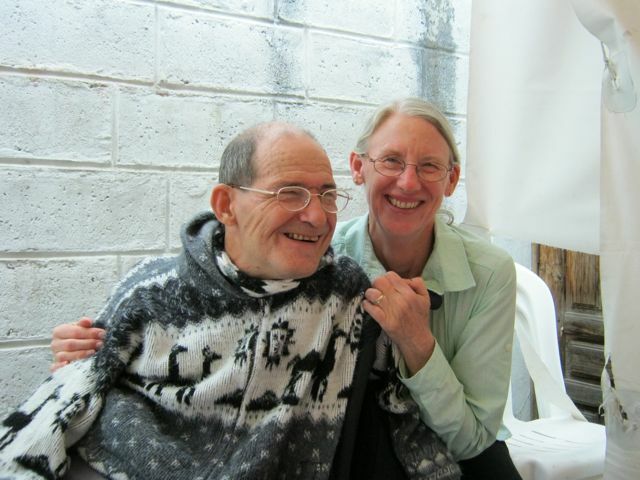 On the way home, we decided to drive through downtown Otavalo to give Roberta and Tom an idea of where things were. Roberta and Tom then walked downtown after lunch. Decorations at Pilar and Tocayo's home. 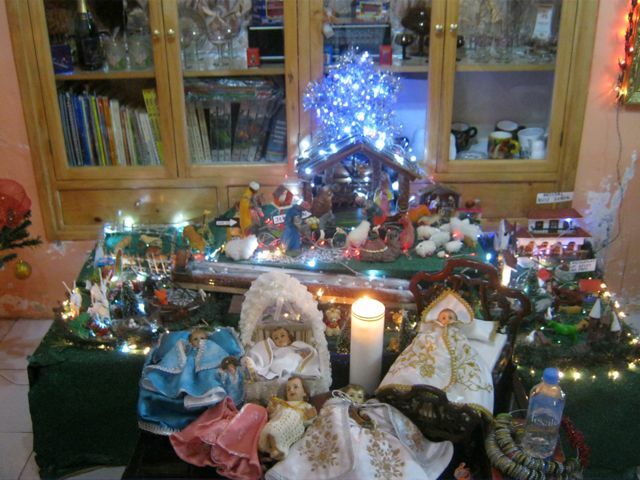 The last novena was held at Tocayo and Pilar’s house. Pilar had really gone all out in decorating her house and it was very festive. She had gotten some ideas from our decorations, but taken them whole steps further. 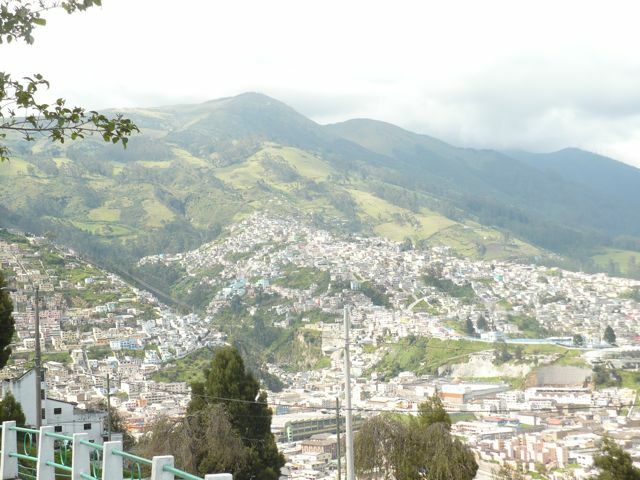 They had even named some of the buildings for places significant to family members in Otavalo. Marilyn, Roberta, and Tom went to the animal market about 8:30 a.m. I didn’t go because it rained heavily last night and I knew it would be muddy. They told me that I couldn’t have gotten around anyhow, except maybe on a road that overlooked the market. When they got back, we had pancakes. Yolanda was here helping Isabel prepare the chicken ceviche for tonight’s Christmas dinner, so she ate breakfast with us and enjoyed the pancakes that Marilyn, and then Tom, made. Yolanda also paid me back for scaring her the other night by startling me while I was writing in the office before breakfast. I’ll have to figure out how to escalate. Tom took Brayan’s bicycle to a bike shop to fix the tires. 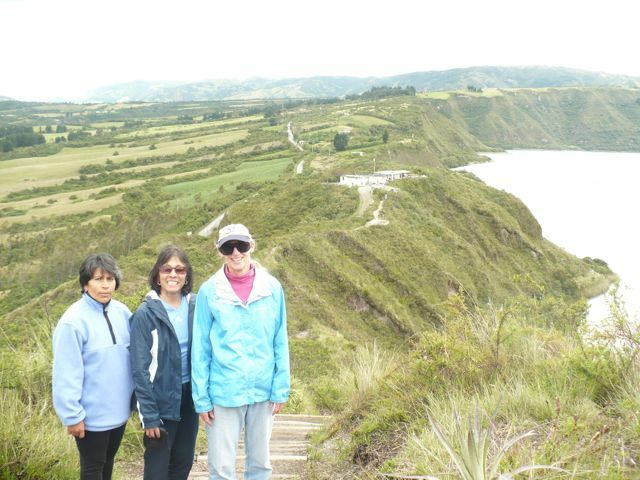 After that, he, Roberta, Marilyn, and Isabel went hiking at Lago Cuicocha on the southern slope of Volcán Cotacachi. Meanwhile, Brayan went over to Tocayo and Pilar’s to play video games with Jorgé Luis. This was the first time he was invited to do such a thing with his teenage male cousins, so he was pretty psyched. We went to mass at the main cathedral downtown. Tonight was the “Blessing of the bebés”. The Catholics here keep a doll representing Baby Jesus in their homes. Victoria has hers as part of a shrine in her bedroom, except during the Christmas holidays. At that time, it is part of a nativity scene. Each Christmas Eve (at least, since we’ve been here), she takes it to mass at the cathedral so it can be blessed by the priest with Holy Water. Luis and Blanca met us at the church. 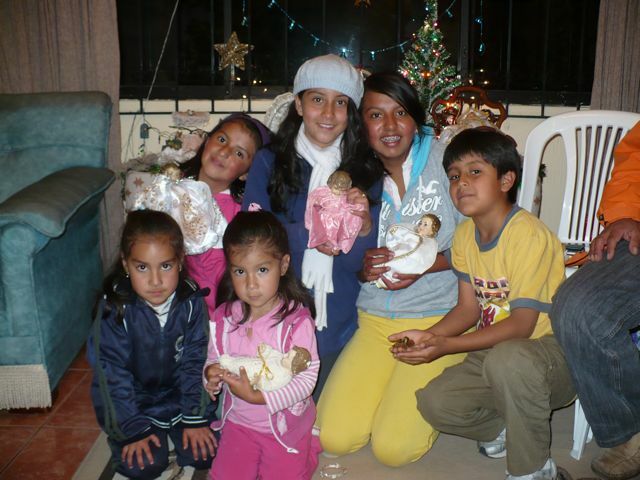 They had just arrived from Quito to spend Christmas Eve and part of Christmas Day with us. We were honored that they accepted our invitation. After mass, almost the entire family came to our house for Christmas dinner. Fireworks were set off as soon as we got home (probably by Tocayo). Canela, our dog, was pretty traumatized, and she was actually quiet for a while, despite so many people being in our home. Isabel, Luz, y Yolanda worked hard in the kitchen, serving the meal. Actually, Yolanda and Isabel worked hard on the meal for most of the day. 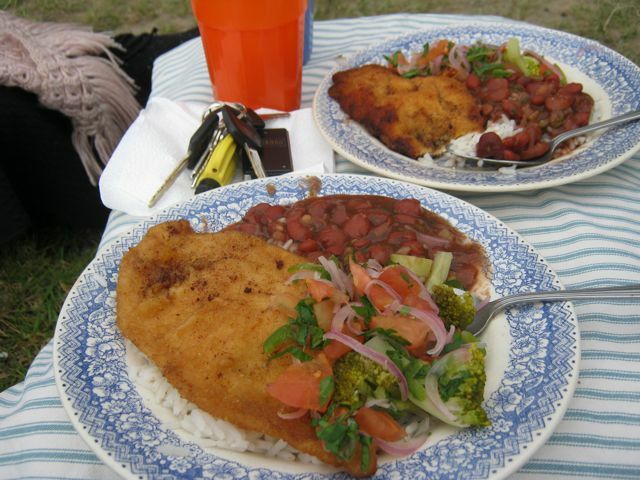 We had ceviche de pollo, red beans and rice (which many had requested after having them at the first novena here), and pork chops. I had intended to buy some beer but forgot, so all we had to drink were soft drinks. Eggnog didn’t even cross our minds. Just after returning home, however, we found time to Skype with Roberta and Tom’s family gathered in Los Angeles. Marisa, their daughter, looked quite a bit different from the three-month-old baby she was when I visited Tom and Roberta 30 years ago. She’s very pretty. Back to the party: The music we had was intended for a novena, not a fiesta. Blanca told Marilyn and me that people were saying the music was sad (even though it was Christmas music). Tocayo came to the rescue when he went upstairs and got Elvis’s sound system and music. The fiesta was certainly more lively after that. There was a whole lot of dancing and laughing. I got to dance with Marilyn, Luz, Blanca, and Isabel before I pooped out. Everyone left by midnight except Yolanda, Carrollito, Luz, and Cesar, whom we wanted to stay. Then we all opened our presents and went to bed happy. If we didn’t dream of sugarplums, it was only because we had even more pleasant visions dancing in our heads. Roberta, Tom, Blanca, and Luis didn’t care about going to Alfredo’s mass this morning, so we stayed home with them and had a leisurely breakfast, with TILLAMOOK SHARP CHEDDAR CHEESE IN THE OMELET. I had been looking forward to Tom and Roberta delivering that cheese for a long time. The cheese here is mostly pretty bland. We all walked to the fiesta being held after the mass. Alfredo has a beer distributorship and sponsors this mass and fiesta each year for his employees and family. Many family members have worked for him at one time or another, and some still do. It was a beautiful day. There was a brass band playing when we arrived. There was free beer – always a hit. Soon, a mariachi band began to play. They sounded pretty out of tune, but it was fun anyhow. 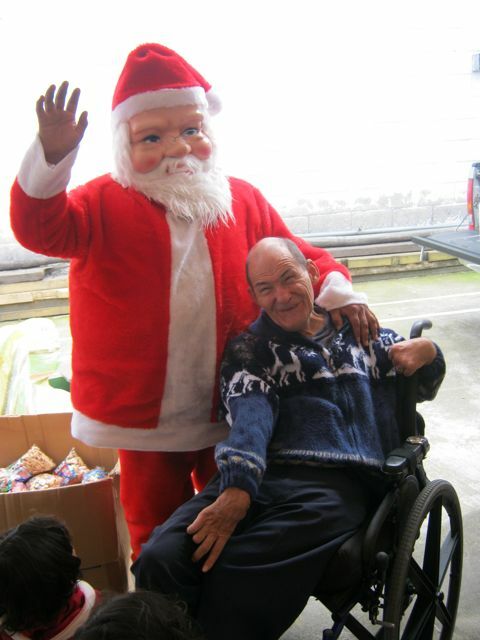 Next, Papa Noél made an appearance and passed out a gift box to each employee’s family and gave sweets to all the children. He also posed for photos with all the children. (I was one of the first in line!) Elvis got home during the fiesta. He hadn’t been able to leave Quito last night because the busses weren’t running by the time he finished work. After almuerzo (lunch), we left so we could get Roberta, Tom, Luis, and Blanca on a bus to Quito. While Blanca and Tom walked to the bus station to wait in line, Marilyn, Luis, Roberta, and I took a taxi to the house to get the luggage. Marilyn then drove Roberta and Luis back to the bus station while I stayed home. A few days later, after having enjoyed their jungle excursion and returned to Tacoma, both Tom and Roberta wrote emails of thanks. In their own styles, they each said that their vacation, especially staying with us, was one of the best they’d ever had. 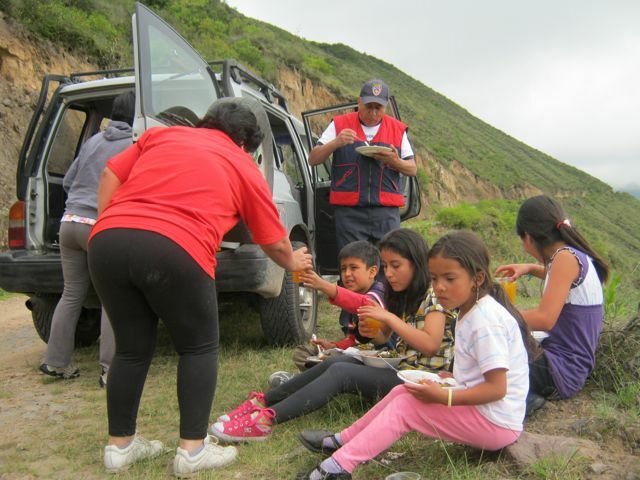 The “guide service” was great, they said, but the thing that really made it special was being able to experience a different culture more intimately through interacting with our Ecuadorian family. We had hoped that would be the case. We were going to go to church today, but Marilyn and I got up very late. We told Isabel we wouldn’t be able to go with her, Victoria, and Brayan. So they didn’t go either. 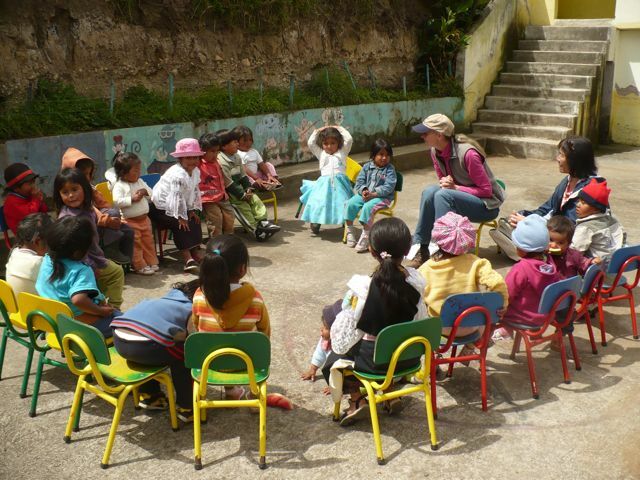 Isabel did take Brayan to play soccer with classmates in Los Pinos, a new development on the edge of Otavalo. When we got around to eating breakfast (at about noon), Isabel and Victoria had waited to eat with us. That was nice, but unnecessary. We don’t want them to faint from hunger or some such tragedy on our accounts. Still, it’s pleasant to know that they like to do as many things as possible with us. When Marilyn said she’d give our last guests a ride home around 8:15 p.m., I went to the office to watch the Superbowl, which had been recording since about 6:00 p.m. I didn’t really care if the New York Giants or the New England Patriots won – I just wanted to see one more good game before next August. Just after I had watched the kickoff, the power went out. That meant I wouldn’t get to watch the whole game. When the power came back on, I decided not to watch the end of the game, preferring to wait and see if there was a rerun the next day, as is often the case here. Now, one really weird thing is that the power hasn’t gone out here for months, something it did quite often when we first moved into this house about a year ago. The other weird thing is that the power had gone out on the last Superbowl Sunday. That time, it went out in the afternoon and came back on just a few minutes after the game had started. No harm, no foul. In fact, we built a fire in the fireplace and all sat around enjoying it and each other’s company. Elvis called it a, “Momentito de familia,” or family moment (though both he and I raced to the office when the lights blinked back on). This time, however, the power failure really put a crimp in my plans. We had already shared family time together, so I felt no guilt in retreating to my office to watch the game. And, really, everyone knows that it’s the unalienable right of each U. S. Citizen, no matter where she or he may be, to watch the Superbowl from beginning to end, plus the zany commercials, live (or recorded at the very least). I’m sad to report that Ecuador, or at least parts of Otavalo, has in place a conspiracy to deny basic human rights to U. S. Citizens. Yes, my faithful readers, this dark plot is known as the Conspiracy Against The Superbowl, or CATS. Please send your donations, prayers, and well wishes to dismantle the horrific CATS and restore my human rights. Meow!!! My birthday is tomorrow, but today is Sunday, the only day when many people in Ecuador don’t have to work. So everyone here, plus Cesar, Luz, and Maria Augusta took me on a trip for my birthday. We also had a great picnic. Cesar and Luz brought two daughters of one of their employees, so there were 10 of us in Molly, our car – a new record for us. 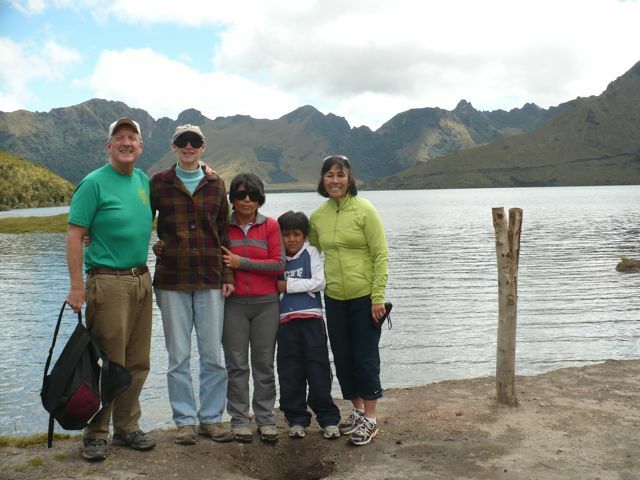 The trip was up a road that I had wanted to travel since I first saw it high on a mountain overlooking Lago Yahuarcocha. We had the picnic on the shoulder of the road with a great view of the lake. (It was not for those who don't like heights, as the drop-off was really steep.) The trip and picnic were a real team effort. Luz and Isabel cooked the food, Marilyn baked me the coconut cake I asked for and also drove, and Cesar knew how to get there. Some para-gliders came by just above our heads while we were eating. There were two people per parachute and it looked like they were in very comfortable seats. I watched them land down by the lake and it was really gentle. So, guess who's thinking about checking that out sometime? It wouldn't be like George H. W. Bush, but close. Marilyn says she may let me do that. She refuses to let me try skydiving. After the picnic, we all started for a hike along the high road. I soon realized that pushing me over the rocky road would wear out everyone, so I decided to stop and let everyone else go ahead. Besides, I couldn’t enjoy the scenery while I was being shaken to bits. 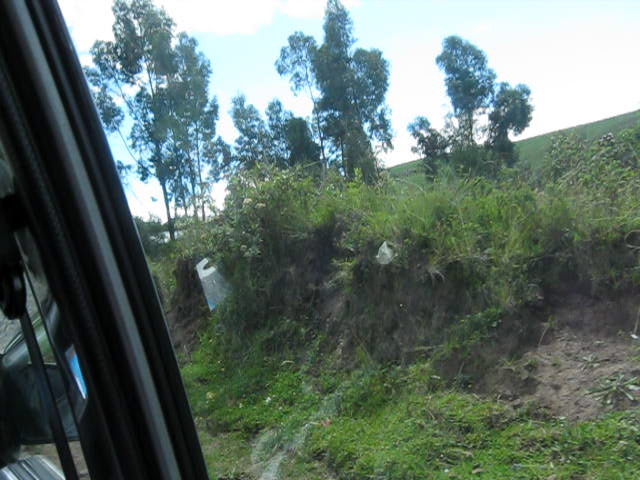 (Cesar told us that this had been the old highway to the city of Tulcan, Ecuador on the Colombian border before the Pan-American Highway had been completed in this area.) Cesar decided to stay with me. He and I didn’t talk very much. We were each in our own worlds – I drinking in the magnificent scenery and he taking pictures, both close-ups of flowers and insects, as well as of the grand vistas. When the rest returned from an enjoyable hike, I reasoned that, since we had had birthday cake, it would be nice to have ice cream, too. Therefore, we headed to Rosalie Suarez in Ibarra for some helados. On the way, people shouted to Marilyn, “¡Pare! ¡Pare!” (“Stop! Stop!“) Poor Brayan had gotten sick and needed to empty his stomach. He didn’t manage to get completely out of the car before doing so. Actually, he hadn’t been feeling well before we left this morning but, of course, he wanted to go anyway. We stopped in front of a house in Ibarra and the people living there were very, very nice. They were outside and immediately fetched some water when they saw what the problem was. After Brayan and the car were cleaned up, we decided that helados today were not a good idea after all.